As in previous years, the LPCB Red Book Pavilion was a prominent feature of Firex International at London Excel on 21-23 June. This year we also had a Pavilion in the IFSEC show which is reported below. The first two days were extremely busy, which was evident in the level of ambient noise! As ever, our Red Book listings were of interest to specifiers such as insurers, facilities managers and consultants. 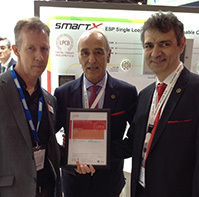 We took the opportunity to present Paradox Hellas with an LPCB certificate for their Smart X addressable control panel (photo right).